Zeppelin attacks had been expected since the beginning of the war with blackouts reminiscent of the Blitz 35 years later in place almost from the declaration of war. Initially, London wasn’t a target for Zeppelin strikes because the Kaiser didn’t want to put members of his family that were part of the British royalty at risk, but this was relaxed in April 1915, to allow for attacks on dockyards. The first attack in London was in May 1915 in Stoke Newington, with the final one on the night of 19 -20 October 1917 with, in total, around 200 deaths in the capital. It is that final raid that this post will focus on as the final bomb fell in Hither Green. Over those two and a half years the Zeppelins had evolved to evade the improving air defence systems on the ground and aircraft attacks on them, much of this involved flying at higher levels of dodge attacks. London wasn’t even the target for the ‘Silent Raid’ of the 19th and 20th October; the 13 Zeppelins were heading for Sheffield, Manchester and Liverpool. They were a new variant of Zeppelin able to fly at 20,000 feet – above the range of fighter planes and anti-aircraft guns. However, on that night they were hindered by gale force winds from the north at that altitude and were forced to turn back. The L45 that was responsible for the raid was heading for Sheffield but turned back and dropped 22 bombs in Northamptonshire before drifting south. We saw some lights – afterwards darkness. We tried to get wireless bearings from Germany but we couldn’t obtain them. Now it was a searchlight, two searchlights – I counted twenty! And that we guessed it must be London. But no shot, we were unseen, and we could see the Thames. Now, running before the wind with a full speed, and we must drop our bombs. We dropped the large bombs, they were 600 pounders, and I heard later on bombs – great bombs – fell on the Piccadilly Circus. The reasons for Zeppelin L45 escaping the searchlights was fog, it was an extremely misty night and had been so for several nights. The Piccadilly Circus bomb killed seven, mainly people waiting for buses, and severely damaged the Swan and Edgar store (at the junction with Regents Street). Another bomb was dropped on the corner of Albany and Calmington Roads (now on the edge of the Aylesbury Estate) in Southwark demolishing three houses, a fishmonger and a Doctor’s Surgery killing 10 people and injuring a further 24. 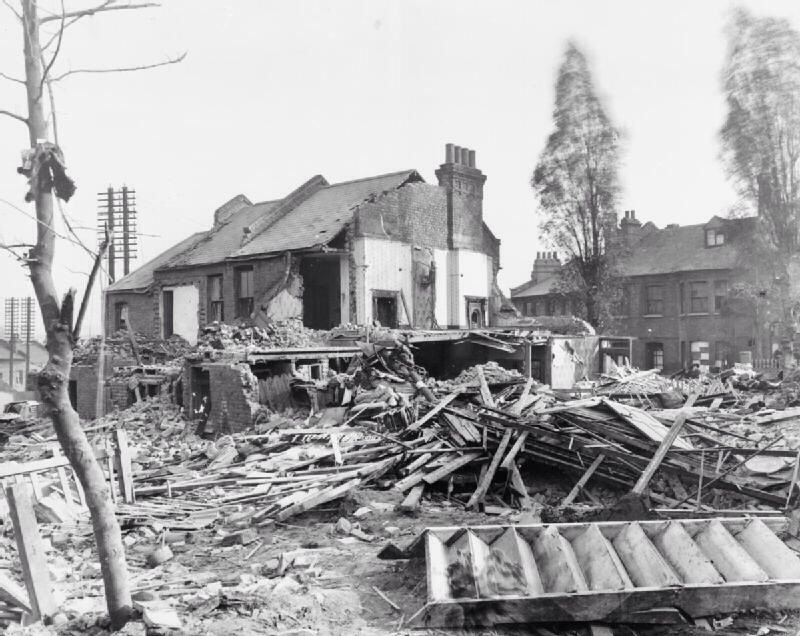 The highest number of casualties of the night though was in Glenview Road in Hither Green where three houses were destroyed and several others seriously damaged in the raid, as the Wikipedia photograph below shows. The homes in Glenview Road were three bedroom terrace houses, probably dating from around 1895 – some of a large number of homes developed in when Hither Green belatedly became a station. By current standards at least, two of them were seriously overcrowded. There were fifteen deaths, ten of which were children and seven of these were all members of the same family – the Kingstons. The Kingstons had moved to Glenview Road sometime after 1911 as at the time of the census they were living nearby at 17 Leahurst Road. They were a family that had moved around a lot – whilst the father, Patrick, was born in Deptford, he had moved to County Tipperary where he had married Mary and they had at least three children in Ireland. They then returned to Deptford in 1902, moving on to Greenwich (1904) and Woolwich (1907) before coming to Lewisham. By 1914 there were 10 children in the family, but Patrick was killed in the Lee sewer tragedy on 15 July 1914 – drowned when attempting to clear a blocked drain a few streets away in Eastdown Park. Another family was decimated too – the Milgates, they had seven children and had lived in Glenview Road since 1895. The father and four children were killed as a result of the attack. The burials of fourteen of the victims were on 24 October 1917 and it was reported that Mrs Kingston attended “with her only surviving daughter, Joyce, and her little boy … [she] was carried in the arms of a man to the graveside”. The burial of Samuel Milgate, a joiner and carpenter, was later as he initially survived but died a few days later in hospital. News about the detail of the bombings was limited in London with no information given about the locations, and there was concern expressed in several newspapers about the lack of warning and the silence of the raids which contributed to the number of casualties. There was also a lot of anger about the raid – the Coroner at the inquest for Samuel Milgate belligerently called for reprisals. The site was not immediately used for housing and was a garage until the 1990s (see map above from 1950, on creative commons from the National Library of Scotland) when the current houses were built in what is now Nightingale Grove. As for the Zeppelin that carried out the bombing – the raid was its last flight as it drifted considerably off course in the wind and was then chased by French aircraft across Lyon and Dijon before being brought down at Sisteron, near Gap in south eastern France and its crew taken prisoner. 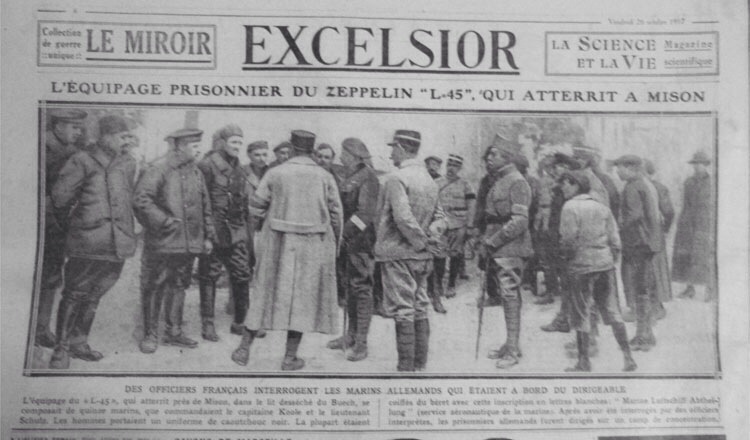 There is a French site about this particular Zeppelin with photos of both the crashed airship and its captured crew, which includes the press cutting below. 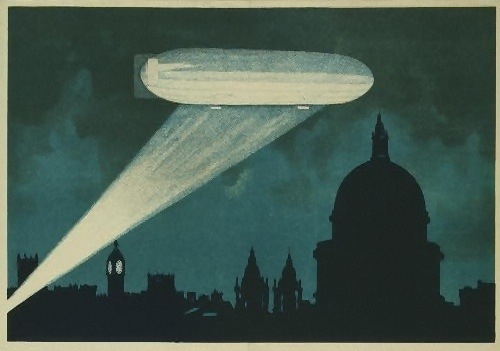 It was the last Zeppelin attack on London. There was a memorial put up for the victims, and those of the Gotha attack on Sydenham Road seven months later at Brockley and Ladywell and Cemetery paid for by public subscription. It was next to the low service personnel memorial in the ‘Lewisham side’ of the cemetery . Over the years the details of those who died became eroded and indecipherable. The Friends of Brockley & Ladywell Cemeteries successfully sought funding to restore this memorial, which is being officially unveiled on Saturday 21st October at 2.30 pm. This entry was posted in Lewisham History and tagged Brockley and Ladywell and Cemetery, Calmington Road, Glenview Road, Hither Green, Nightingale Grove, Piccadilly Circus bomb, Silent Zeppelin raid, Swan and Edgar bomb, World War 1, Zeppelin, Zeppelin L45 on August 7, 2014 by Paul B. Thank you for a very interesting and informative article. The modern houses you mention were built in the 1990’s, before then a motor car service garage occupied the site for number of years. Thanks – that’s brilliant – will add to the post, couldn’t work out why there hadn’t been earlier replacements. Hi I have read somewhere that there might be newspaper photos of Mrs Kingston and her daughter do you know if this is true ? I haven’t seen any I am afraid, I have access to a couple of on-line newspaper archives and neither have any photos. It is possible that Lewisham archives might have access to others. It is with noting though, that newspaper photos were much more rare than they were a generation later. Glad to have been of help! Mrs Kingston had an incredibly tough life, the loss of her husband just before the war, the loss of so many children due to the Zeppelin attack and her son’s conviction for murder during WW2 (there is a link below, if you haven’t come across it). Were you aware of/able to attend the unveiling of the memorial at Brockley and Ladywell Cemetery on the centenary of the attack? It received some coverage on the BBC local news. I can send you a link (I suspect it may no longer be on the BBC website though) and a photo of the relatives and various others, if it would be of interest. Sadly, the link isn’t working any more, the BBC don’t keep links to local news up very long. There are a few photos of the unveiling via the link below.